were real and which are just myths and legends. Compared to pets, all mythical creatures and beasts are described as enormous, even bigger than horses or bulls, and some even bigger than elephants. There are many well known mythical monsters from the rich mythology around the world that inspire awe, fear and dread. We’ve put up a list of the 10 best mythical creatures and beasts that are by far the most popular ones in the world. 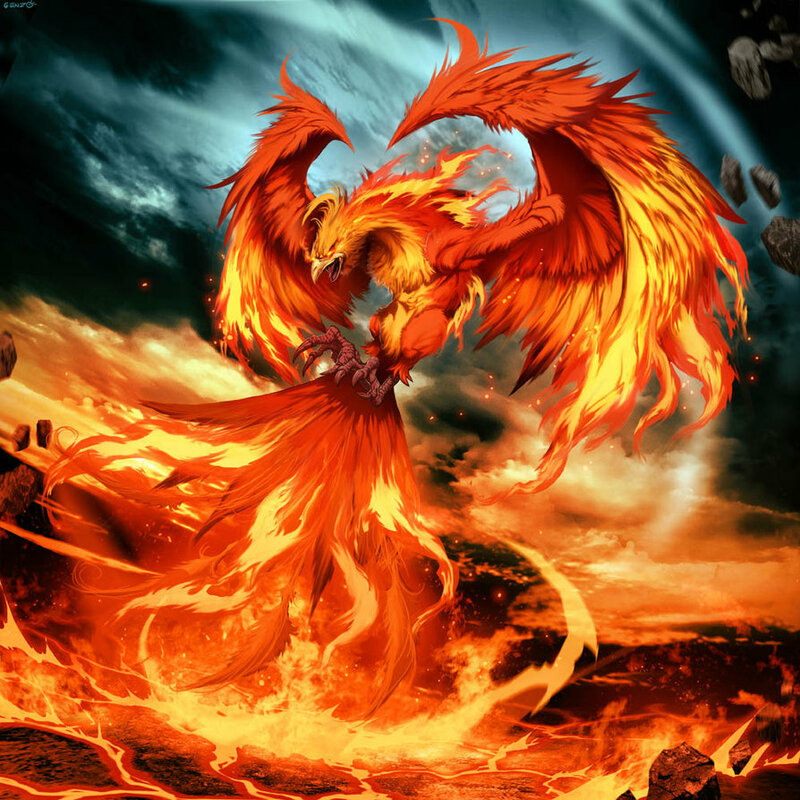 Phoenix is one of those mythical creatures and beasts in which many of us believe. It is first described in about 500 years before Christ in some ancient writings in Greece. The Phoenix was a sacred mythical fire bird with vibrant plumage and a tail of splendid colors which differ considerably according to various legends. Although it looked fierce, Phoenix would never kill a single living thing as it survived eating only spices and quenching its thirst with dew. This magnificent bird had a long life cycle lasting from 500 to 1000 years long. It is believed that the magical Phoenix’s tear was pure and contained extreme healing powers. Cyclopes were power Gods in the Greek mythology with frightening features and preferred to eat human beings. They are described as hard-workers with debauched life full of force, violence and intrigues, and with only eye, because they traded the other to see the future. It is believed that the Cyclopes gave the thunder and the lightning to Zeus as a gift for their releasing from the depths of the Underworld by their father Uranus. Strange beliefs, but who knows, maybe they really existed and terrified the world as told. In Slavic mythology, Leshy is a cheeky guardian spirit of the woods that used to take its victims to his cave and tickle them to death. Leshy is described as a tall peasant with shoes on the wrong feet and in some books with wings and tail. He could change his size enormously and can also shape-shift into a person, an animal or even a large talking mushroom. In case you encounter to Leshy, you must turn all your clothes inside out and place your shoes on the wrong feet. The cockatrice is one of the most famous creatures, mainly because of its appearances in books and films. It is believed that the cockatrice was able to turn people to stone with a single glance or to kill with a single touch. With head of a rooster, full dragon wings and a combo of body scales and feathers, they often say that it is a cross between a rooster and a dragon. The Cockatrice’s weaknesses were seeing their own reflection or hearing a rooster crow. Morgan Le Fay is believed to be the most powerful witch in the world of all time and she “lived” in the medieval days of King Arthur. It is unknown if she was real or not, but she is known for her dark and powerful spells and by her capability to transform herself into whatever she wanted. Morgan Le Fay was able to spy on everyone and everything that was going on in the land. Fenrir is a gigantic wolf that comes from the Norse Mythology and the son of the devious Norse god named Loki. Loki’s intentions was to destroy all humans and the whole Earth with help of Fenrir and his brother, but the other Norse Gods separated Fenrir from Loki when it was just a pup. The pup grew to a gigantic size very quickly and the Gods decided to chain him up and keep him locked up until the end of time. The chains could not hold him long and the Gods had to enlist the help of some dwarves to create a magical ribbon called Glepnir. Once the gigantic wolf was bound with the enchanted ribbon, Fenrir could absolutely no longer break free. The Russian folklore promises that every home has a creature called Domovoi. It is a small bearded man running around your house with ability to shape-shift into the physical forms of its human and animal housemates. It is up to you is your Domovoi good or evil: use foul language – he’ll be cruel, be clean – he’ll be nice. The Russian believe that if you yell: “Grandfather Dobrokhot, please come into my house and tend the flocks” you can meet your Domovoi. The stories that come from the Japanese often mention a vampire cat. This kind of cat appears if a man kills a cat without taking proper precautions, the spirit of the cat will avenge itself by killing him. The vampire cat enters the man who killed it, who then gradually wastes away while gesturing like a cat and meowing. This awful death by the cat can be prevented by eating a part of it when it is killed or it can be cured by killing a second cat and eating it. Banshee is another Irish creature that was usually seen as an omen and messenger of death. She was usually seen wearing a grey or white hooded cloak and her hair frequently was long and light in color. Although she wasn’t seen too often, her cries could always be heard at night when someone is about to die. One of her weird features was her capability to transform into animals associated with witchcraft such as a crow, weasel and hare. Baba Yaga was a thin, frail looking witch with sharp teeth, her jewelry was made of bones and long dirty fingernails. This mythical creature comes from the Russian folklore and it is believed that she was very powerful witch. It is believed that she had the power to control people and animals to do her bidding, could throw spells to paralyze individuals and could even control the weather. She used to eat human flesh as her favorite meal and the unfortunate passersby or lost travelers mostly served her as meal.